Switchgrass (right) and no-till corn growing in Nebraska in a soil carbon sequestration study that has been in progress since 1998. Around 66 million years ago, a grasslike ancestor began to evolve into the plants eventually used to breed food crops like rice, corn, sorghum, and sugar cane. Panicum virgatum, or switchgrass, another plant descended from this ancient group, might someday become the energy equivalent of its food crop relatives—a biomass feedstock used to produce heat, light, and transportation fuels. To further these prospects, the U.S. Department of Agriculture’s National Institute of Food and Agriculture has awarded a 5-year, $25 million grant to Iowa State University and its partners, including the Agricultural Research Service, to fund a project called “CenUSA.” This study will investigate agricultural systems in the central United States for producing advanced transportation fuels from perennial grasses grown on land that is either unsuitable or only marginally suitable for row crop production. The project researchers will also study approaches for improving the sustainability of existing cropping systems by incorporating perennial grasses into production systems as bioenergy crops, which will reduce nutrient runoff from fields, decrease erosion, and increase soil carbon sequestration. Geneticist Ken Vogel, who works at ARS’s Grain, Forage, and Bioenergy Research Unit in Lincoln, Nebraska, will lead CenUSA’s “Germplasm to Harvest” group. Geneticist Michael Casler, who works at ARS’s U.S. Dairy Forage Research Center in Madison, Wisconsin, will be partnering in CenUSA’s breeding and genetics research. Casler and colleagues will use new DNA markers to develop predictive equations for identifying traits that enhance yield. They will use these equations to breed and evaluate new experimental strains for yield and biofuel-conversion potential. These strains will be evaluated in field trials prior to release as cultivars for commercial use by the biofuels industry. Agronomist Rob Mitchell, who works with Vogel in Lincoln, will be coleading management-systems studies of bioenergy crops in a 14-field network across the central part of the country. “We’re using field trials to evaluate the switchgrass and other material that Vogel and Casler have already developed,” Mitchell says. ARS and university scientists in Illinois, Indiana, Iowa, Minnesota, Missouri, Nebraska, and Wisconsin will also evaluate the latest improved genetic materials and find the best ways to integrate new perennial bioenergy grasses into food-crop-production landscapes. Their work will include research on nitrogen cycling, carbon cycling, and greenhouse gas emissions—a key project component, since there is little information on greenhouse gas emissions for bioenergy crops. This data will be needed to develop biofuels that produce lower total emissions throughout the production-and-conversion cycle than the emissions associated with petroleum-based fuels. The researchers will monitor water use by these crops and develop ways to optimize water-use efficiency, because water availability could be the single most limiting factor in U.S. biomass production. They will also compare the production inputs needed for the experimental biomass crops to those needed for corn. “This will let us compare the production and economic benefits and costs of different bioenergy crops to those of other production systems,” Mitchell says. Mitchell’s team will assess the net energy balance for different biomass systems, including yields, agricultural inputs, and other production factors. These results will help producers optimize the sustainable production of perennial feedstocks on less-productive cropland—not the prime farmland needed for food and feed crops like corn and soybean. Back in the laboratory, chemical engineer Bruce Dien will be looking for traits in the switchgrass cultivars that are associated with how readily the plant’s sugars can be converted into biofuels. Dien works at the ARS National Center for Agricultural Utilization Research in Peoria, Illinois. Another ARS chemical engineer, Akwasi Boateng, will be looking for ways to streamline production of fuel via pyrolysis, a very-high-temperature conversion process where plant material is thermally decomposed in the absence of oxygen. Pyrolysis produces a dense bio-oil that can be readily converted into renewable jet, diesel, and other biofuels. Vogel, who has been working on switchgrass for more than two decades (see “ARS and the Regional Biomass Research Centers,” pages 4-6), is optimistic that switchgrass and other North American perennial natives will someday become major components in U.S. agriculture for biofuel production. 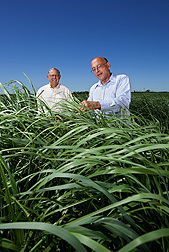 “I’m glad that so many scientists are now working together on ways of establishing switchgrass as a bioenergy crop that can help the United States develop its own renewable energy sources,” Vogel says.—By Ann Perry, Agricultural Research Service Information Staff. To reach scientists mentioned in this article, contact Ann Perry, USDA-ARS Information Staff, 5601 Sunnyside Ave., Beltsville MD 20705-5129; (301) 504-1628. The ARS locations included in this story are part of USDA’s Regional Biomass Research Centers (RBRC) network. The RBRC is made up of five national centers whose mission is to help accelerate the establishment and production of sustainable commercial biomass from farms and forests without disrupting the production and marketing of food, feed, and fiber. ARS geneticist Sarah Hake and University of California-Berkeley colleague George Chuck study juvenile traits of corngrass. They have found that inserting a specific Corngrass gene into switchgrass keeps it in its juvenile form. 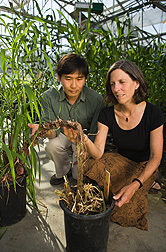 ARS geneticist Sarah Hake and University of California-Berkeley colleague George Chuck are conducting research that could have far-reaching implications for developing switchgrass as a biofuel crop. They have found that inserting a specific gene called Corngrass from corn into switchgrass essentially keeps the perennial grass in its juvenile form—a plant that doesn’t flower, produce seeds, or have a dormant growth phase. “Since these transgenic plants don’t flower, the starch doesn’t need to travel inside the plant to the inflorescence to support the flowering stage. Instead, the starch stays in the stem,” says Hake, who works at the ARS Plant Gene Expression Center in Albany, California. “The leaves are not nearly as stiff as leaves in a plant that hasn’t been modified. We also found that leaf lignin in transgenic plants is slightly different than leaf lignin in other plants.” Lignin modification will be a key factor in the commercial development of cellulosic ethanol, because lignin structures must be broken down to release sugars that are fermented into biofuel. “Right now we’re introducing DNA segments called ‘genetic promoters’ to turn on the Corngrass gene in the shoot, but not the root, to help increase root mass development that is otherwise inhibited,” Hake says. “The development of nonflowering switchgrass varieties would eliminate the possibility that transgenes could escape into the environment and contaminate non-transgene plants. But we have a lot more work to do before transgenic switchgrass is ready for prime time.”—By Ann Perry, Agricultural Research Service Information Staff. 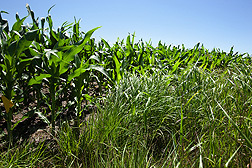 "Biofuel Prospects With Prairie Perennials" was published in the September 2012 issue of Agricultural Research magazine.